United States | STOP Framing "us"
Want to know how to live longer, happier and healthier lives? Help bring the documentary based on The Spirit Level to life. It’s almost official: The Spirit Level may be coming to a theatre near you! Researchers from the UK have linked nearly every major social problem we experience in the United States to just one thing. This short clip explains it all! Sam Pizzigati, editor of Too Much outlines the illuminating research proposed by the authors of The Spirit Level, Richard Wilkinson and Kate Pickett. Together, these two British Epidemiologists have compiled irrefutable evidence revealing the devastating impact income inequality has on entire societies. For a quick summary of their evidence, take a look at the graph below. As illustrated in this graph, the United States is literally off the charts in every major social ill experienced. We lead the world in having the highest percentage of our population behind bars, we have the highest rates of depression, homicides, an alarming number of citizens with drug and alcohol addiction, an obesity epidemic, high teenage birth rates, high infant mortality rates, and the lowest levels of trust in our fellow citizens, and despite repeated framing attempts, the United States also has the lowest level of social mobility compared to most other industrialized countries throughout the globe. All of these negative social outcomes are a result of a system of income inequality that is detrimental to our health and well being, and is destroying the communities we live in. 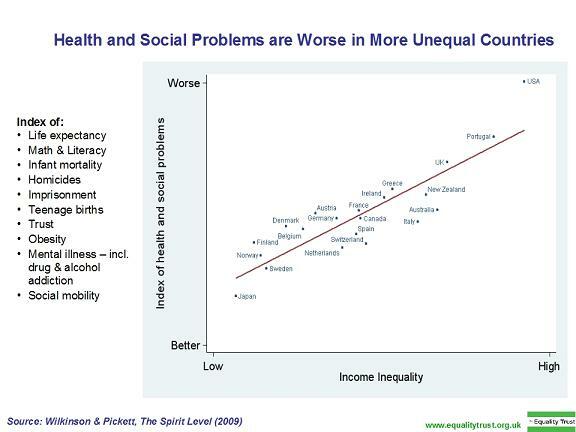 “If you want to know why one country does better or worse than another,” as Wilkinson and Pickett note simply, “the first thing to look at is the extent of inequality.” “People in more equal societies simply live longer, healthier, and happier lives than people in more unequal societies. And not just poor people in these societies, Wilkinson and Pickett emphasize continually, but all people. “And the nations that do the best, on yardstick after yardstick, all turn out to share one basic trait. They all share their wealth. Unfortunately, we have been led to believe that a more equal distribution of income, framed as a “redistribution of wealth” is bad for society. In reality, as this evidence based research shows, the exact opposite is true! Fortunately, there is light at the end of this tunnel. As this research shows, a more equal distribution of income has been proven to drastically reduce the social ills experienced within countries, and will lead to a happier and healthier society for all. Therefore, pursuing policies that advocate for a more equal distribution of income, or cutting income inequality in half, as Wilkinson and Pickett advocate, is a great place to start. Given the nature and scope of the problem we face in this country, it is imperative that we help independent film artists bring this evidence-based research to a theatre near you!